Hey Look! 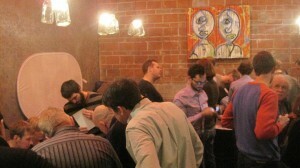 People like Bikes! Earlier on our facebook page we shared a link to a new survey about attitudes towards bike infrastructure among Seattle voters. A few hours later, The Stranger did us all a favor and put up an infographic summarizing the key points. The results are pretty plain: Most people in Seattle like bikes and feeling unsafe on our streets is one of the main reasons people do not bike more in Seattle. When it comes to transportation in Seattle, there is much more consensus about what needs to be done than some voices would have us think. 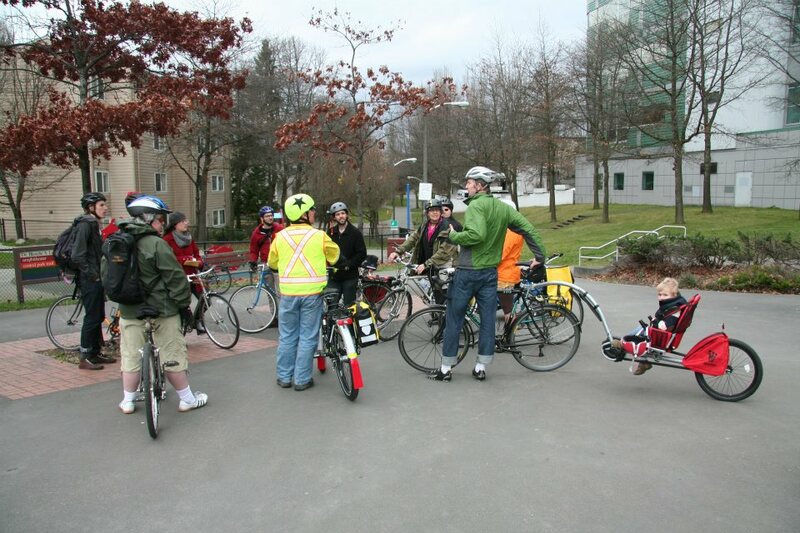 78% of the people surveyed stated that they were pro-bike. 60% of the people surveyed would like to ride more than they do today. 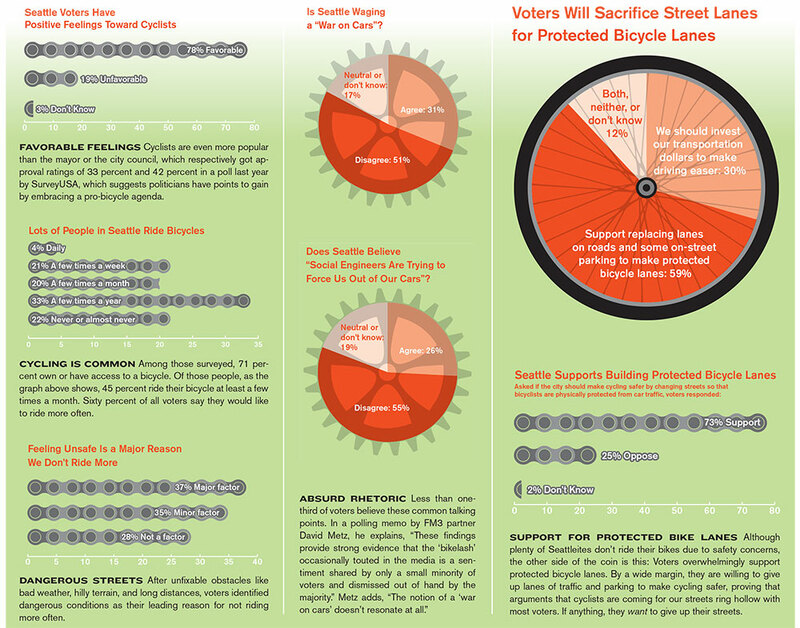 86% of the people surveyed support neighborhood greenways and 58% support building infrastructure that boosts safety for cyclists in Seattle, even if it calls for reconfiguring the roadway. That’s huge. Safe streets for everyone is a goal that almost everyone can agree on. What’s more is that one of the biggest factors keeping people from getting on their bike is something that we have control over: Safety. 72% of those surveyed named feeling unsafe on the road as a barrier to getting on their bike, but we don’t have to settle for a bicycle network that only serves the most fearless cyclists. 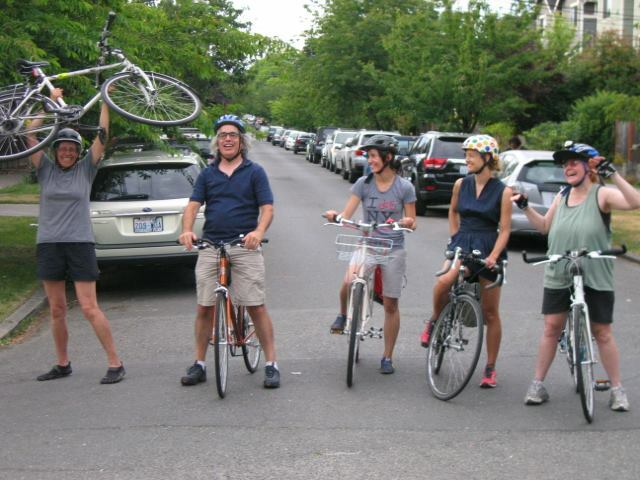 Neighborhood greenways help create an all ages and abilities alternative to biking on streets where less frequent riders routinely feel unsafe. 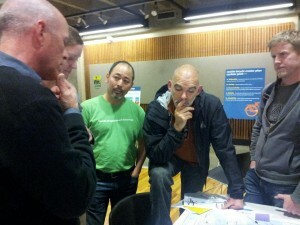 Creating safe neighborhood connections with neighborhood greenways directly addresses a major barrier to biking and it turns out people think that is a good move for Seattle’s transportation mix. Want to read the whole report? Check it out on Scribd! 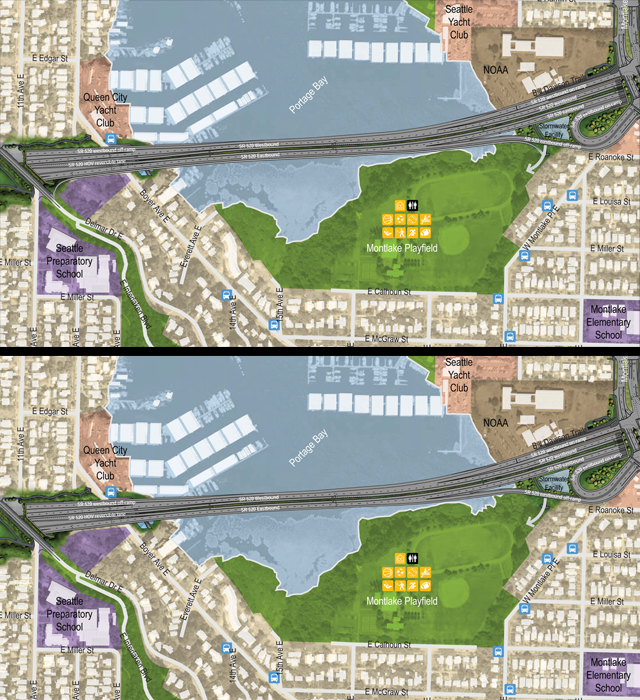 As promised in the “SR-520 Design Will Discourage Walking and Biking to the UW and University Link” post, here is some further elaboration on the value of a Portage Bay Bridge Trail. Currently the idea is bouncing around the halls of Seattle City government – stayed tuned to see if the trail makes it into an official recommendation to WSDOT. The glaciers did not have walking and biking in mind when they sculpted Seattle, and north Capitol Hill in particular. This geological heritage is part of what gives Seattle its character. North-South elongated hills, hidden valleys, and numerous glacially carved bodies of water. As beautiful as it is, this natural character poses serious challenges to creating an interconnected system of family-friendly walking and biking infrastructure. It would not be hyperbole to think of north Capitol Hill as a topographic fortress. It is surrounded to the east, north, and west by very steep slopes. To the best of our knowledge, there is no ADA accessible route for walking or biking off of north Capitol Hill (check out the map below – compiled from city data and our measurements). Complicating the situation, the streets that were slightly less steep were cherry picked to be arterials for car traffic. 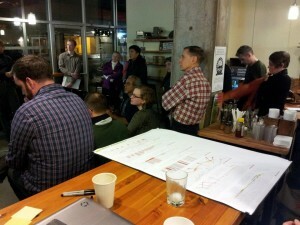 As a result, creating an all-ages-and-abilities friendly route between the “urban centers” of Capitol Hill and the University District, and further to neighborhoods in N.E. Seattle and to the Central District, is quite a challenge. A Portage Bay Bridge Trail would bridge this topographic fortress. 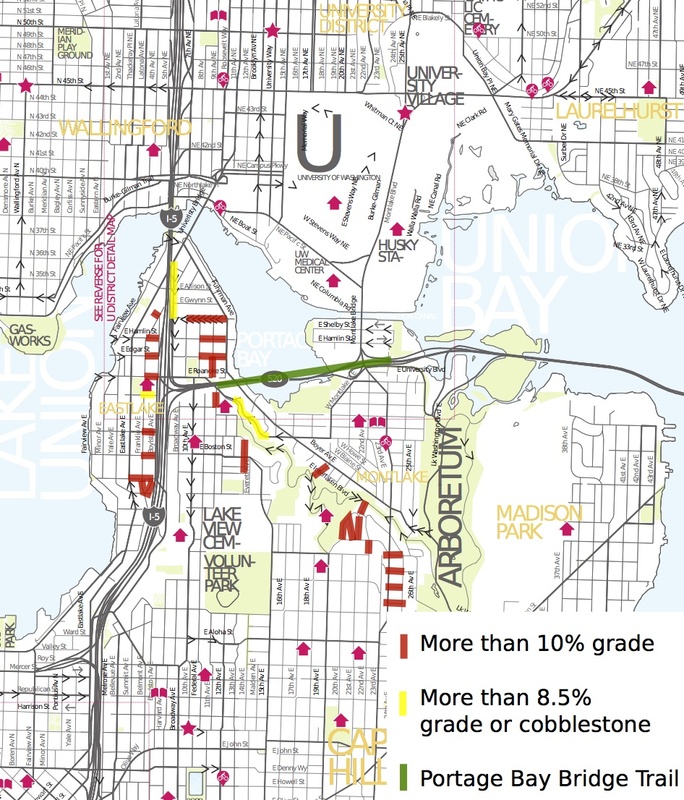 According to WSDOT, the Portage Bay Bridge Trail (PBBT) would have less than a 5% grade, be well lit, and be considerably more direct in getting to the “Montlake Hub” of regional trails and to Husky Stadium side of the UW campus. 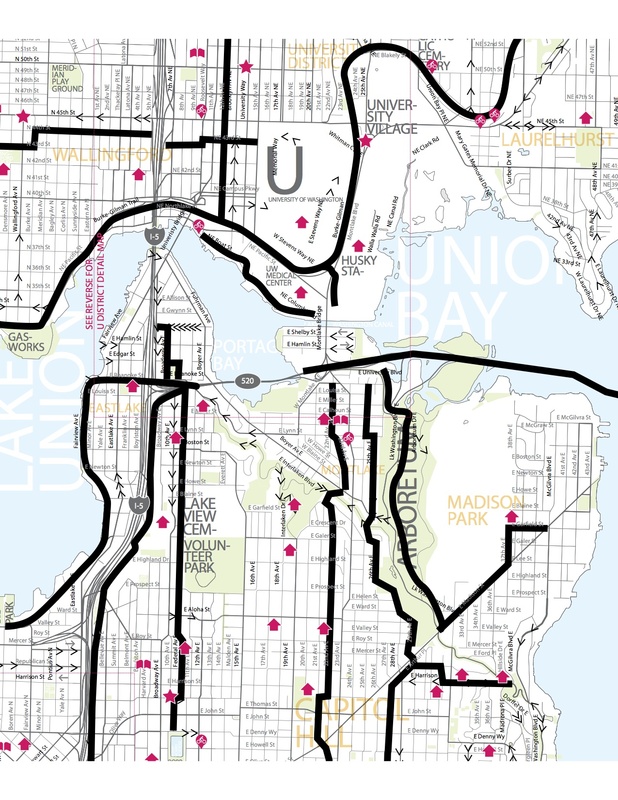 It would be the most direct and family-friendly route from the Montlake Hub to Capitol Hill by far. Even in terms of getting between Capitol Hill and the East UW Campus, taking the PBBT would only be slightly longer than a Harvard Ave E route (1.89 versus 1.63 miles), but would be significantly less steep (4.5% versus 8.7% grade), and much better protected from traffic. Even amongst experienced cyclists, research has found that “cyclists are willing to go considerably out of their way to use a bike boulevard or bike path rather than an arterial bike lane,” and that people will go over three times more out of their way to avoid routes with slopes of over 6% grade compared to those with 4-6% grade (click here find the full article). This effect would likely be more pronounced in people who are willing-but-wary. In other words, since the PBBT will be better separated and less steep than other options, people will choose to use it over routes that currently exist even if they are shorter. Let’s look at a few of the existing alternatives. Currently many people cross the notoriously dangerous Eastlake Ave E at/to Harvard Ave E, crossing 4 very busy arterial lanes. Harvard Ave E has a 8.7% grade and also serves bus routes and is used by I-5 and 520 traffic. Creating a family-friendly connection across the extremely busy Eastlake Ave E and up the very steep Harvard Ave E to E Shelby St is no small task. 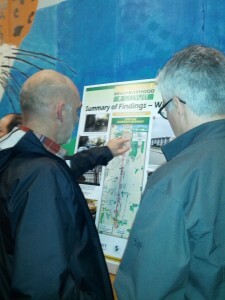 Eastlake Greenways and Central Seattle Greenways are working together to determine whether this connection could ever be made accessible for people of all-ages-and-abilities. Don’t hold your breath. Its arterial designation combined with the lack of separation for the bike lanes mean that according to Seattle Neighborhood Greenway guidelines (drawn from the Mineta report) it is not suitable for people of all-ages-and-abilities. It’s 8.5% grade means that it is very steep. The bike lanes are narrow and act as gutters due to the large amount of debris that collects in the roadway. A curvy road and numerous driveways create the very real possibility for conflicts. In order to access Delmar, it is necessarily to wind your way through the non-intuitive and disjointed Montlake street grid. Decrease the lane width – the bridge is slated to be restricted to 45 mph, meaning that lanes can be an urban width rather than suburban freeway sized. Finally it may be worth considering how hanging the Portage Bay Bridge Trail in different manners (underneath, partially offset, raised, etc) affects the light situation. 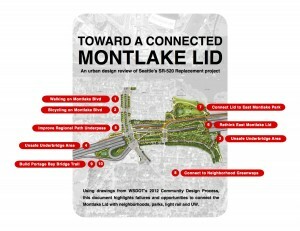 How will the PBBT connect through the Montlake 520 interchange? 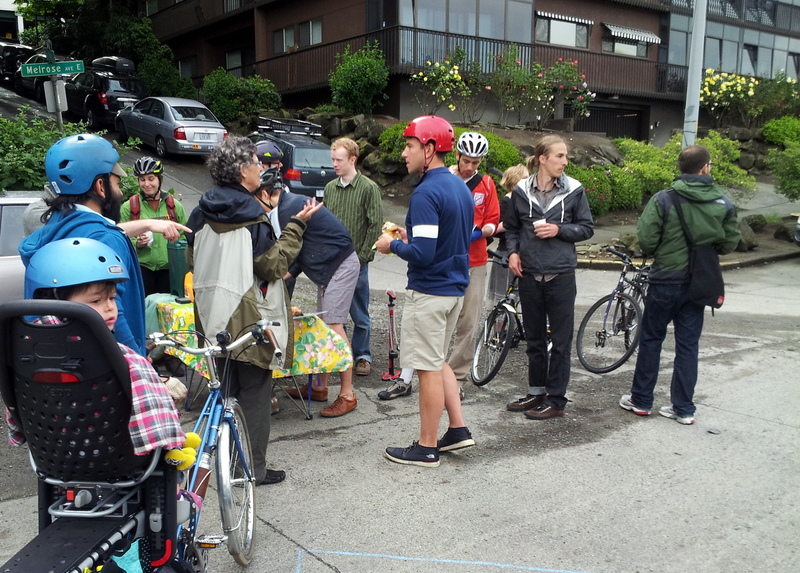 tl;dr – 5 Minutes to Support the Portage Bay Bridge Multi-Use Trail! This is the difference between the width of a bridge with and without the bike and pedestrian trail that we support. This is to scale. 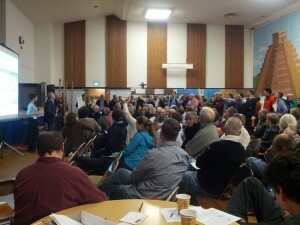 Yesterday, we posted a monster post that went over the WSDOT’s 520 Online Survey with a fine-tooth comb. We know that that is a lot to go through, so we are offering today the “too long, didn’t read (tl;dr)” version of what we posted yesterday.